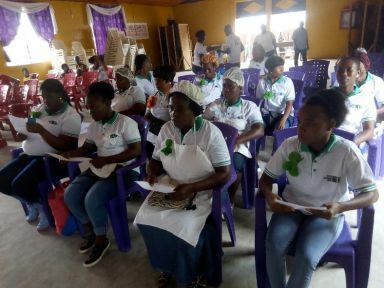 In an effort to restore the hope of underprivileged persons in the country, Rescue Alternatives Liberia (RAL) has concluded its seventh training circle holistic rehabilitation of vulnerable persons in Monrovia. Rescue Alternatives Liberia (RAL) is a local nongovernmental human rights organization that has over the years been providing alternatives to enhancing human rights, rule of law, peace and democracy building and victim’s recovery. The beneficiaries of the seventh circle were trained in hair dressing, baking among others. They are identified by field officers of the organization, counseled and prepared them for the six months intensive training. Speaking at the closing ceremony of the seventh circle, the Program Coordinator of Rescue Alternatives Liberia, Sam Nimely expressed happiness that the beneficiaries were able to complete the seventh circle despite challenges facing them in their various homes. According to Nimely, the organization will continue to be in constant contacts with the graduates to ensure they put into practice what they have learned from the training. He told the exuberance beneficiaries and guests in the hall that as civil society organization, they remain supportive of the Liberian Government at all times and the government should see them as partner in working together to solve some of the problems confronting the country. “Put in practice what you have learned. Don’t allow your talent to die down; we will continue to work with you because when you are empowered, people don’t overlook you. People will respect you and you must do something positive. Count on us because we are now one family and we must continue to interact,” Nimely said. Also speaking was 38 years old Agnes Chea who has five children, but lost her husband during the Ebola outbreak in the country. Agnes narrated that she thought hope has lost completely, but has been able to rewrite the future since she benefited from the six circle of Rescue Alternatives Liberia holistic rehabilitation of vulnerable persons. Again, Sonny Onyegbula who was representing the Country Representative of the Office of the HighCommissioner for Human Rights (OHCHR) urged the graduates to make use of the six months training, something he said is very fruitful because it will make them put the trauma in the past. Onyegbula praised the excellent works of Rescue Alternatives Liberia (RAL) for being a reliable local organization in the country and assured the organization of the unflinching supports of OHCHR. “We will make the organization to succeed. We provide technical assistance to CSOs for the protection of human rights. RAL is reliable, so we will continue to support them,” he said. The total of 26 students graduated from the seventh circle with support from the United Nations Voluntary Fund for Victims of Tortures.